HELSOTT Unveils TOM PETTY Cover Video For "Runnin' Down A Dream"
To commemorate the first anniversary of Tom Petty's passing, the California-based pagan metal group HELSOTT has released a music video for their rendition of his 1989 classic, “Runnin' Down A Dream”, which features ELVENKING violinist Lethien. Watch The Video For “Runnin' Down A Dream” on KNAC.COM HERE. 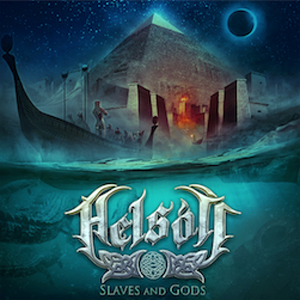 HELSOTT's cover of “Runnin' Down A Dream” appears on the group's second full-length album, Slaves And Gods, due Oct. 12 via M-Theory Audio. In addition to Lethien, the album features a number of notable guests from the world of folk metal, including Masha Scream (ARKONA), Lazar (ARKONA), Dr. Leif Kjonnsfleis (TROLLFEST), Trollmannen (TROLLFEST), Damna (ELVENKING), Lethien (ELVENKING), Dom Crey (EQUILIBRIUM, NOTHGARD), Kevin Storm and more. Slaves And Gods was mixed and mastered by J-F Dagenais (KATAKLYSM, MISERY INDEX, DESPISED ICON) and features cover art by Felipe Machado Franco (ICED EARTH, BLIND FUARDIAN, RHAPSODY OF FIRE). Physical copies on CD and limited-edition blue marble vinyl can be pre-ordered via the M-Theory Audio webshop, while digital pre-orders – which include instant downloads of “Runnin' Down A Dream” and the title track – are now underway via Bandcamp, iTunes and Amazon. Since forming eight years ago, HELSOTT – whose name means “fatal illness” in Old Norse – has paid homage to pagan cultures and mythologies while keeping true to their American influences. The group first caught the attention of audiences on a large scale during the 2013 Paganfest North American Tour, where they performed with ENSIFERUM, TYR and TROLLFEST. They built further momentum the following year via their debut full-length, Woven, behind which they toured alongside ARKONA and HEIDEVOLK, and on subsequent tours with the likes of I AM MORBID, NECROPHAGIA and TENGGER CAVALRY. HELSOTT recently headlined the fourth annual Maryland Folk Metal Festival and will announce tour dates for the West Coast and Europe in the coming weeks.